To answer this question, I made my way to Tilted Kilt in Denver. This place was huge and had a setup more in line with Buffalo Wild Wings than any Hooters I had ever been to. The menu was chock-full of typical bar food at a reasonable price. For some reason I had decided in my head that I had eaten too many burgers lately and decided against that. I also knew we were in a rush and as the world’s slowest buffalo wing eater, I had to pass that up as well. I landed on The French, We Mean Irish Dip. Yeah, that was a cute way of trying to make the French Dip fit into the theme, but other than the name this thing was pure French Dip. A pure unvegan dream, this sandwich was filled with shaved rib eye steak, Swiss cheese and nothing else. 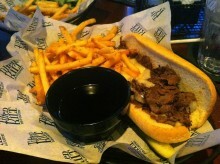 It was served with au jus and my choice of a side. I went with the fries to keep it real. Despite not mentioning pickles on the menu, this sandwich was served with on in the basket. Unfortunately, it contaminated a few fries and the bun, which was devastating, but not disastrous. Now, onto better things. I’ll be the first to admit I’m no expert in the field of French Dips (not sure that such experts exist), but I was actually pretty impressed with the sandwich. It contained a fair amount of meat and gooey cheese that would have been enough on their own to satisfy me. Well, sort of. You see, the bun was pretty thick and had me scared at first. Dry, it would have been overwhelming, but when dipped in the au jus, it soaked up those juices perfectly and made for a great French Dip conduit. The fries were your normal cut, but had been fried to the crispy end of the spectrum that I know and love, then topped with some mild seasoning. 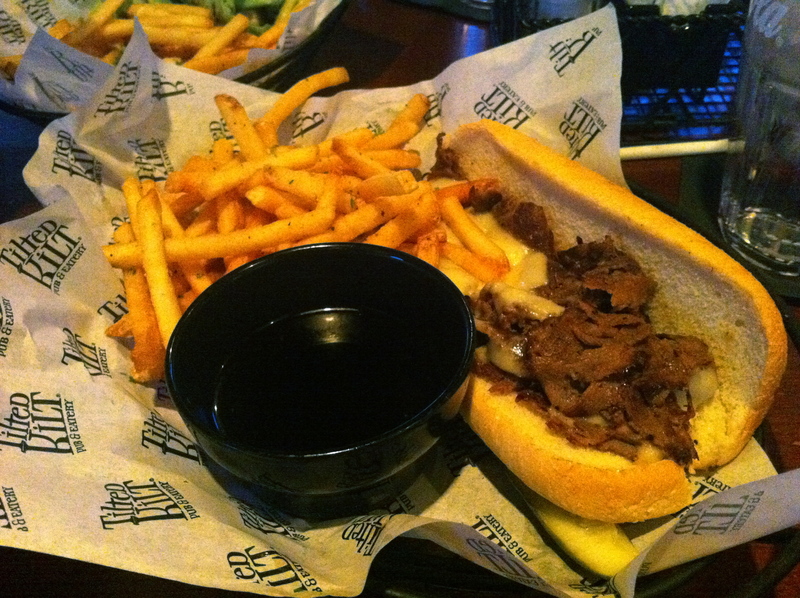 Did the meal at Tilted Kilt blow me away? No. But even without the gimmicky clothing I’d be willing to make a return journey. They may not be the most creative, but they do a swell job with bar food. And the outfits sure don’t hurt.